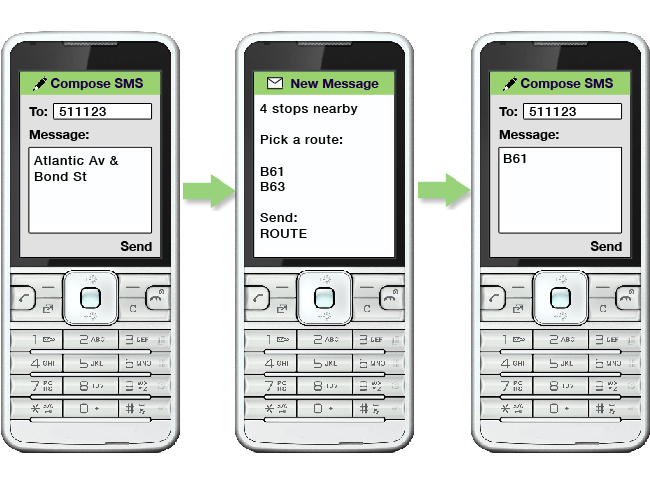 If you send just a bus route, MTA Bus Time returns only whether the route is scheduled to run or not. It does not include any information about when buses will arrive to your stop. Adding a route to either type of search limits the results to that bus route. Sending a stop code to MTA Bus Time returns a list of all upcoming bus arrivals to that stop. Searching by bus stop code is the most precise way to find out about upcoming bus arrivals to your stop. When you're at the bus stop, you can find the stop's code by looking at the schedule box posted on the bus stop pole. See Finding Your Bus Stop Code for more information. Sometimes, a stop will have routes that are not scheduled at that time. In this case, MTA Bus Time responds with a message to this effect. Similarly, a route can be scheduled to run, but the buses have passed your stop and there are no buses headed to it at this time. In this case, MTA Bus Time responds that there are no buses en route. Bus routes with service changes are marked by asterisks. Service changes details are available by replying "C + ROUTE". Note that you don't actually have to type a '+', just separate the route with a space. MTA Bus Time will only display the first part of the service change, up to the length of a single text message. There may be more than one service change, in which case MTA Bus Time will prompt you to send "N" for the next one. For more details on Service Changes for a bus route please refer to Bus Service Changes from MTA.info. 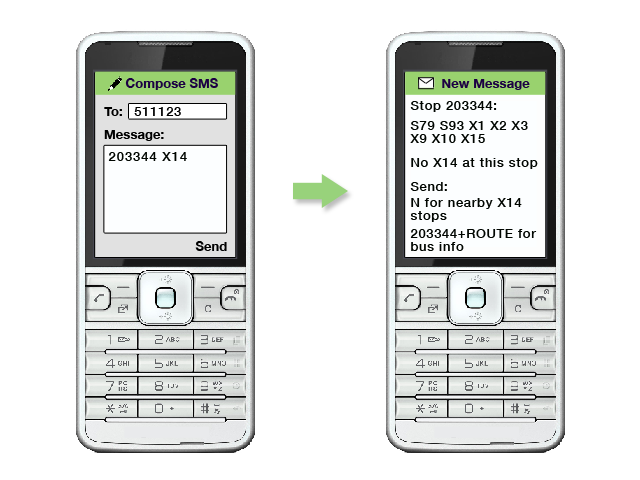 If you receive a "no stops found" message, verify the bus stop code you entered is correct, try sending an INTERSECTION + ROUTE or refer to Troubleshooting. 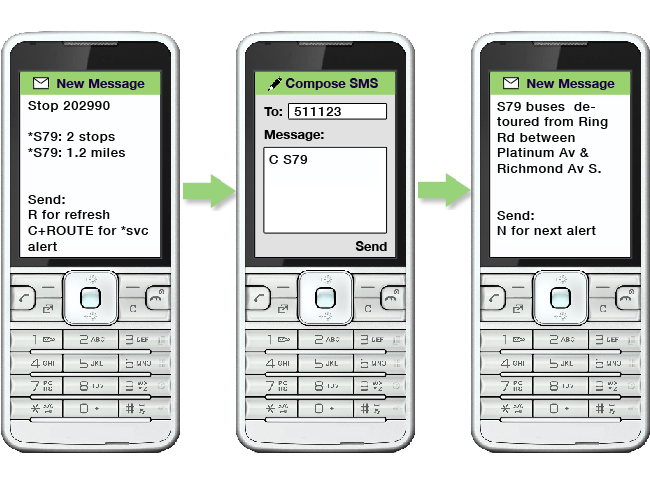 When you send MTA Bus Time an intersection (with or without a bus route), MTA Bus Time will return a list of bus stops nearby, up to the character limit of one SMS message. If you specify a route, MTA Bus Time will also show bus arrivals for the route you specify. 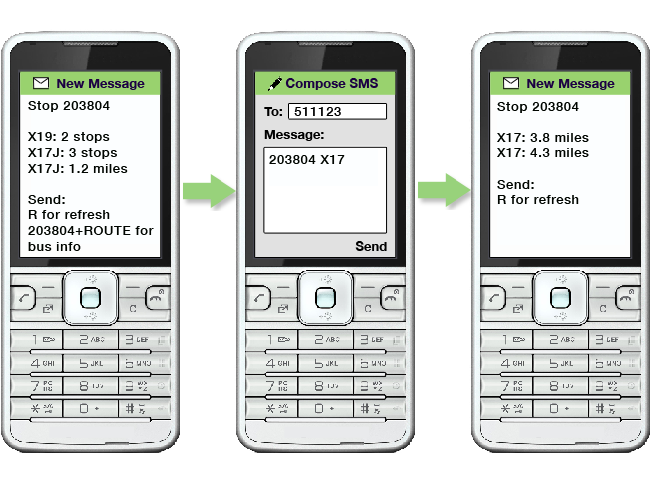 Send a text message to 511123 with an intersection and route. MTA Bus Time will send back the two directions that route travels. 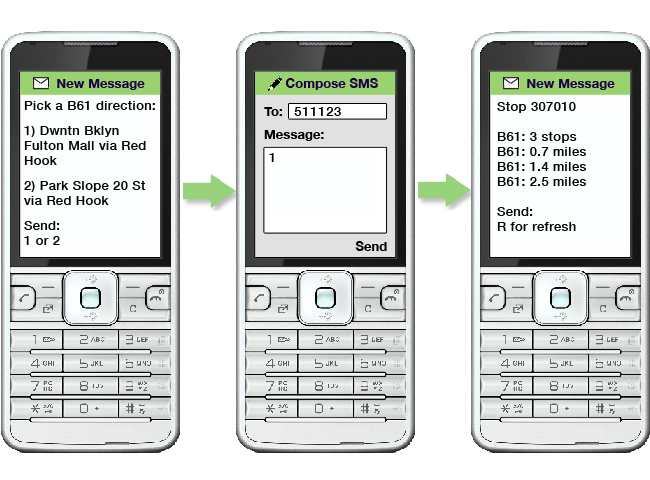 Send your selection and MTA Bus Time responds with the stop information corresponding to your selections, as above. Ambiguous addresses and intersections return a list of possible intersections along with their ZIP codes in NY (not all location results returned are served by MTA Bus Time yet). At any time, reply with one of the suggested options to see which stops are near that intersection (you may be prompted to select a route and direction) or try the suggestions under Troubleshooting. ROUTE* service change notice for a route: reply with 'C' + ROUTE for more information or visit Bus Service Changes from MTA.info. Your stop code or intersection could not be found or your stop is not yet being served by routes equipped with MTA Bus Time. If a phone isn’t receiving text messages – or if it's getting texts that say “mobile messaging is blocked” – there’s usually one of two reasons. 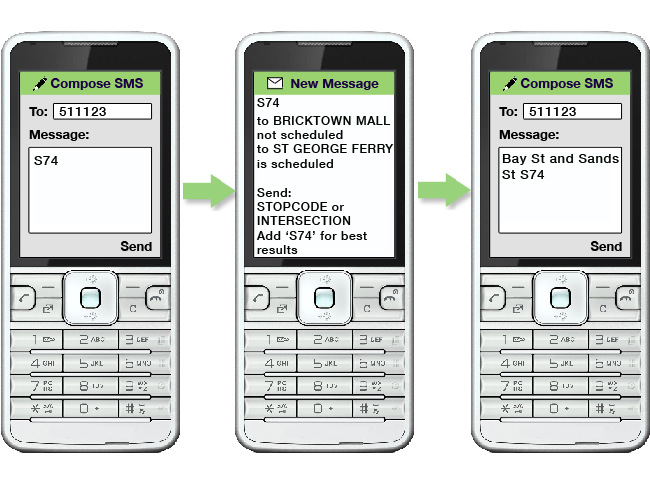 1) The phone plan doesn’t support messages from short codes (the 5-6 digit numbers many organizations use for SMS such as MTA Bus Time's 511123). 2) There’s a parental control in place that prohibits text messages. The best solution is to contact the service provider and check the phone plan. Make sure that the phone can receive messages from short codes, and there are no parental controls in place. Also try Troubleshooting for more help.